Over the summer I had the great pleasure of hosting a very special guest in my Intro to Film class at Oakton Community College: Erica Mann Ramis. 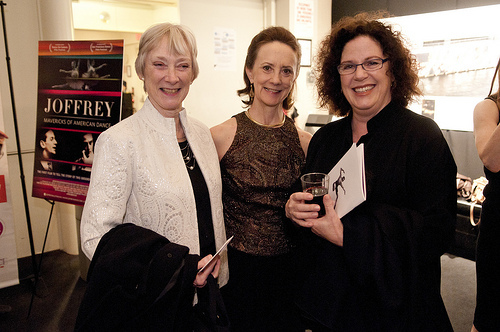 The occasion was the screening of a terrific 2012 documentary that Ramis produced, Joffrey: Mavericks of American Dance. The film combines archival footage with incisive new interviews to paint a vivid portrait of the fascinating relationship between the Joffrey Ballet’s co-founders, the larger-than-life personalities Robert Joffrey and Gerald Arpino, and shows how the evolution of their company over the past half century has mirrored changes in American society. Below is a transcript of our informal interview, which occurred in front of my class, immediately prior to the screening. EMR: (laughing) You don’t want to know. MGS: (laughing) Actually, I really do. MGS: Yes, I mentioned to the class that your father, Daniel Mann, was a noted stage and film director. He worked with everyone from James Dean . . .
MGS: Yes, to Marlon Brando in Teahouse of the August Moon. And, of course, he directed Liz Taylor in her first Oscar-winning performance . . .
MGS: Yes, and also one of my favorite actresses, Anna Magnani . . .
EMR: That was his favorite actress. MGS: Really? He and I have similar tastes then. MGS: Yes. That must have been a really interesting environment to grow up in. EMR: Here’s my answer: it was! My father made a lot of films. He made many of them in New York. So, even though I grew up in L.A., we went to New York a lot to be with him. It was a whole different world of moviemaking then. There were studios. If you were a director you would sign with a studio for, you know, whatever, 10 films. And, you know, my father wore a suit and tie to work. And there’s photographs of us as children really dressed up to go to the set. My father started on Broadway. He did Come Back, Little Sheba on Broadway and he did Paint Your Wagon on Broadway — the musical. And actors loved him, actresses loved him. It was a different world. The business world and the creative world were very separate. In my father’s world he was the creative one. And always, the business world, they were there to cut you down and make you come in under budget. But he worked really, really well with actors. And, later in his life he taught directing and I got to sit in on some of his classes. And working with people to see a scene done that you could’ve fallen asleep (during), and then see him work with people to get it to the point where you were absolutely emotionally involved, it was pretty remarkable to see. He just had incredible communication with people. He was tough. He was very tough. He had very high standards. He was very concerned about society and issues and social justice. He was not a Communist but many of his friends were card-carrying Communists and were blacklisted during that time. There were many people over that were artists and intellects and musicians. And it was the kind of thing as a kid when you’re running in and out of the house, you would hear interesting conversations that somehow sunk in. A woman and her husband, Salka and Peter Vertiel, owned our house before us and all the German expats, they had a salon: like Greta Garbo and Charlie Chaplin and all those people would come to our house. So when I was a child their mail still came. Letters came for Greta Garbo and I collected them . . .
MGS: (laughing) So you opened them and read them, right? EMR: They were mostly not much personal but . . . I’m not sure I really answered your question. But I skirted it. MGS: No, you did. That’s amazing. It sounds like an amazing environment to grow up in. Did you feel like going into the “family business” as a kid? EMR: I still feel like it. MGS: Well, you have. When you were growing up, were you interested in pursuing an acting career? EMR: I always wrote. I still write poetry and I have some unfinished screenplays that — maybe now that our youngest child is going to college — I’ll attempt to finish. I always wanted to write and I did study acting although it was sort of to see writing from another point of view. And I loved it. I really, really loved it. I had fabulous teachers and some horrible teachers. I think it’s so important in anything like that to trust your gut even if you don’t know a lot. If you aren’t feeling like you’re being opened up and uplifted, I’d say go somewhere else. The hard thing with my father, as his child . . . There were many hard things but one of them was when I first wanted to study acting in high school, he said, “Nobody can teach you to act. You either come into the world with this gift or you don’t have it.” I’d sit there and go, “Well, I mean, I just want to take a class. I’d like to get on the stage.” And the truth is, whatever he meant by that, he also taught acting and he taught directing and he was talking about some untouchable . . . something you can’t even say to a child. It wasn’t right, it was not okay. MGS: It was too advanced. MGS: So, speaking of acting, you were in Club Paradise. EMR: I worked on that movie as an assistant to the director (Harold Ramis) who ended up being my husband. MGS: But you had a bit part in the film as well . . .
EMR: I did, I did. I worked for the producer on that movie. The bit part had no words. They were all internal (laughs). MGS: What is your credit? Isn’t it “Girl . . .”? EMR: It’s “Erica Mann — Girl at Bar” (laughs). It was a lot of fun to do. I was with Eugene Levy and Rick Moranis. Club Paradise was one of Harold’s movies that came and went rather quickly but I actually like it. It was a lot of fun to do. We were on the island of Jamaica for four months — the cast and crew and all and it was pretty great. MGS: Were you still pursuing acting then or were you more interested . . .
EMR: I was more interested in writing. So working in production had really little to do with my love but I thought it was a great opportunity and a great way to learn. And I loved moviemaking. I’ve been on movie sets all my life. I still — if I’m going on set or if I’m in L.A. and go to a studio — I still get butterflies. I just love it. I love taking nothing and creating something, whether it’s good, bad or indifferent. I mean, obviously, good is great and bad is not so great but when you’re making a film, everyone — even the worst of movies, I promise you — when people are working on them, everyone believes in the film. Because you’re working 14, 16-hour days and you’re suddenly like on an island, figuratively speaking, with 150, 200 people and you’re making magic one way or another. MGS: I’ve made a couple of short films and I know exactly what you’re talking about — the synergy between the cast and crew. It’s a labor of love for everybody because they’re not doing it for the money. MGS: And your husband has an enormous amount of integrity to be working in Hollywood in the present day. It’s tough, I think, to navigate a career in Hollywood today. EMR: But he was very lucky. I mean, the first screenplay he wrote was Animal House, and the first movie he directed was Caddyshack . . .
MGS: And that success has allowed him to do more personal work in recent years? MGS: Groundhog Day is one of my favorites. I actually show that in class a lot. And, also, I’m a big fan of The Ice Harvest. EMR: Are you? Wow, I’m gonna tell him you said that. MGS: That’s a really underrated film. EMR: It is. I think when people are successful for being in comedy, when you change your tune a little bit it’s very hard to be well received. And Ice Harvest is kind of film noir-ish and edgy in a way that Harold never really had done before. MGS: Right. It’s a black comedy. EMR: Yeah, and I really like it. I agree with you. MGS: And it’s a great Christmas movie too. MGS: (to class) You all should see The Ice Harvest if you have not — with John Cusack and Billy Bob Thornton. MGS: And Oliver Platt who kind of steals the movie . . .
EMR: I love him. Very funny. MGS: Okay, let’s talk about Joffrey now. How did this movie come about and how did you end up producing it? EMR: Gerald Arpino, who is one of the partners — he and Robert Joffrey started the Joffrey in the 50s in Seattle. Harold and I first moved here in 1996. I think the Joffrey had come maybe that year or the year before to Chicago. And we had the opportunity of meeting Gerald Arpino. And I kind of fell in love with him. And I think he kind of fell in love with Harold. But that’s okay. (laughs) No, he loved me too. MGS: And were you a fan of ballet before that? EMR: Oh yeah. I did study dance. Dance and poetry were my first loves. So I studied, not ballet, but modern dance for many years through college. I love dance. 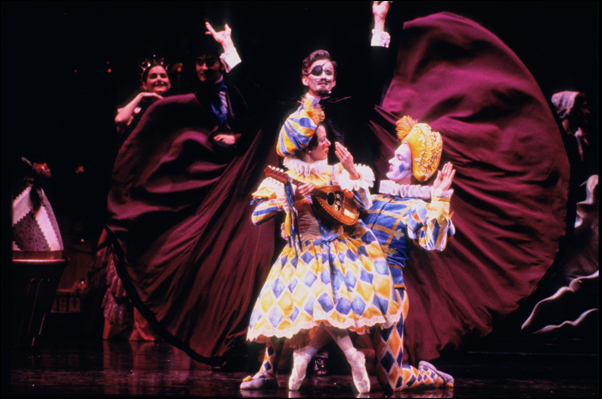 We initially met Gerry because Harold came up with an idea for a ballet, a big story ballet. And it was a wonderful idea. We had lunch on a yacht. It was so dramatic. We had lunch and we went out on the lake and we had just moved here and suddenly there was this huge thunder and lightning storm. I was absolutely terrified. I kept just wanting everyone to say, “You’ll be okay.” And Harold told him the whole story. And he (Gerry) loved it. But he said to do a ballet of that caliber would be millions and millions and millions of dollars. It was impossible to do. But we really liked each other and so we all just got together a lot. If they had, like their season here, let’s say it’s, I don’t know, 10 shows or whatever it is, I would go to see the same show every single night. Because I loved it so much and I just connected with Gerry’s choreography. So the way it happened, we have other friends from Michigan and they were down — we all went to the Joffrey Gala some years ago and Gerry was quite elderly and frail. And I hadn’t seen him in a couple of years and it really was surprising to see. And as we were leaving, we were both in our separate cars and we called each other and we all four had the same idea at the same time: “Why don’t we just get Gerry on film? Let’s just tape him. Let’s interview him. He might not be here very long.” And I don’t think he’s ever been interviewed that way before. MGS: To tell the story of the company? EMR: Yeah, and about him and about dance and whatnot. So we knew about this documentary film house called Media Process and Bob Hercules who directed it. So we called him and said “Right now we just want to get Gerry on tape.” So at first we just did these interviews with Gerry that were fabulous and we had some of the dancers doing rehearsals in the studio with him and that’s the last time . . . it was his choreography. It was his first piece and his last. And that was the last time we ever saw him. It was so incredible. EMR: Yeah. So once we had that, then we thought “What if we develop this?” And then we met with the heads of the Joffrey and with various people and it all just started happening. We were very lucky. MGS: It sounds like when you started out, you didn’t really know what the final form of it was going to be . . .
EMR: No. At first we didn’t even know we were making a film. We knew we wanted him and from that we’d see. After we had that we thought “It’s crazy not to make a film.” And then with the director and Una Jackman, who was also my producing partner, we did a lot of research and read a lot of books about the Joffrey and started calling and traveling all over the country to do interviews with people connected and dancers. And then Bob the director started talking about form and it was really like having a puzzle. Here was this footage with Gerry, which turns out, as I think you’ll see in the film, we couldn’t use a lot of it because he really looked like he was on his last legs. And he was. It was very poignant. MGS: But that (interview) was the seed? EMR: But that was the seed. And then the rest of putting it together came from: “Who will we interview? What are we asking them? What’s our goal here?” Once we got all of that, it all had to be transcribed, you know? And then you start piecing it all together and we filmed actual dancing and rehearsals. And it was wonderful. MGS: And I think that’s a good place for us to stop. Thank you so much for chatting with me. This entry was posted on Monday, August 26th, 2013 at 9:30 am	and tagged with Bob Hercules, Club Paradise, Daniel Mann, Erica Mann Ramis, Groundhog Day, Harold Ramis, Joffrey: Mavericks of American Dance, The Ice Harvest and posted in Chicago Movies, Interviews. You can follow any responses to this entry through the RSS 2.0 feed. Thoroughly enjoyed this interesting interview–thx, for sharing it! Thank you! Erica was very sweet and gracious to come speak to my class. I hope this interview will direct even a few more people towards her wonderful documentary. I will definitely check it out from my library so that I can get the full picture. Looks great! Great. I would love to watch it again with you.